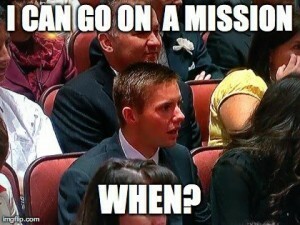 Josh Hanson’s jaw dropped even before President Thomas S. Monson finished making his announcement Saturday. As President Monson, president of The Church of Jesus Christ of Latter-day Saints, lead into the big policy change on missionary ages, Hanson could tell something big was about to happen. As the reality of what he was saying sunk in, Hanson’s jaw unhinged and froze into a face that openly showed the reaction of many who were listening as intently as he was.